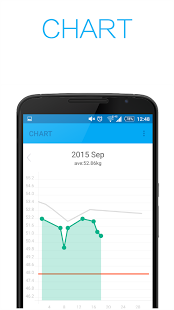 You only have to input your weight to be able to see graphs and lists charting increases or decreases since your last input. 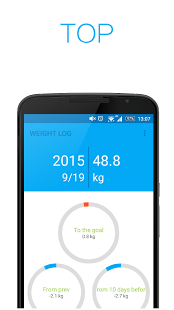 It's essential for dieting and health management to keep track of your weight by weighing yourself daily. However, it's difficult to continue this on a long-term basis. 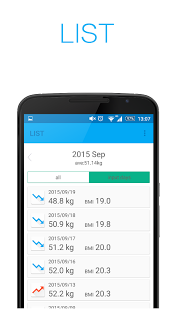 This application, created with long-term use in mind, has the simplest of functions for ease of use. Simply enter your weight, with no other complications necessary. 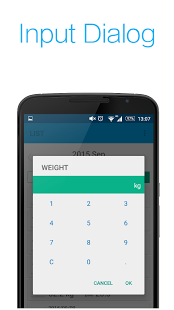 When you input your weight on a particular day, you can view your current BMI, amount remaining to your target weight, and your weight gain or loss since your last data input. You can see your progress from the previous month in graph form, or view your weight gain or loss in a list format, all the while checking how much you have left to go until you hit your goals. 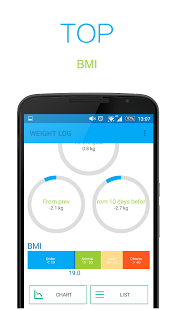 I created this app hoping that recording your weight every day will become an enjoyable experience. I very much hope that this app is useful for you during your diet. â»This software includes the work that is distributed in the Apache License 2.0.